Here is Part 4 of my series on baby gear, organized in the order of Amazon’s Baby Registry. The entire multi-part series can be found with the Baby Gear tag here. 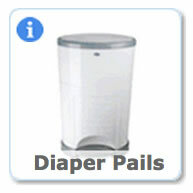 This time I’ll talk about our experiences with diaper pails. It works more or less, but like with razors and printers, the bag refills are where they make their profits. Each refill canister is really only 3-4 bags of diapers and they cost $6-$8 each. So essentially you’re paying upwards of $2 for a plastic bag! Compare this with under 10 cents for a kitchen trash bag from Costco. Also, the advertised “count” refers to an imaginary pile of newborn diapers that are vacuum sealed or something because I’ve never fit that many. Wrap up your diapers as tightly as possible. 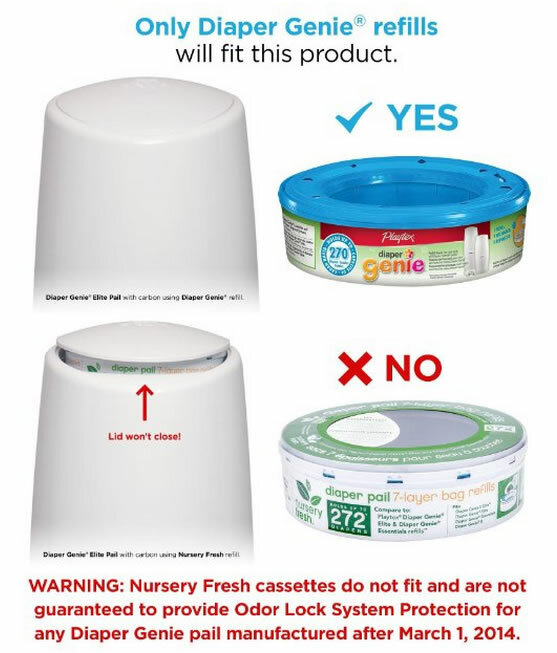 Throw the pee diapers in the regular trash and only the poops in the diaper pail. Don’t waste too much bag when cutting and tying. Make sure you squeeze all the excess air out. Some use scissors instead of the provided cutter. I used to use those wire twist ties from other bags. Use a plain kitchen trash bag wrapped around an empty refill canister. Note that it won’t fit perfectly and we got mixed results. Buy generic refills. Note that Diaper Genie changed their design so they might not fit right anymore on new models. Check it out. Rather lame attempt at keeping their monopoly, in my opinion. When your Diaper Genie bag is full, place a regular trash bag underneath and cut only the bottom knot. Let the diapers all fall into your 10 cent kitchen trash bag and throw that away. If you keep your wrapped diapers clean your refill liners can last 5 times longer or more. We experimented all these things (with my prodding). In the end, my wife didn’t want to deal with any added hassles and we just buy the overpriced refills at Sam’s Club. I personally throw all the non-stinky diapers that I change straight in the regular the garbage. Verdict: Considering you only fit around 50 diapers max at $2 a bag, that’s 4 cents a diaper which is an additional 20% of the cost of the diaper itself. In the end, you either think the reduced odor and convenience is worth the extra cost (my wife) or think you should just throw your diapers in a regular trash pail and wrap up the stinky poops in an extra plastic bag (me). For what you’ll be paying in refills you could buy a really nice trash can that will last for a long time. Free Red Bull products (either Red Bull ® Energy Drink or Red Bull ® Sugarfree, as selected on the Claim Form) with a retail value of approximately $15.00 (the “Product Option”). They will mail it to you at their cost. This is all taken from the official site EnergyDrinkSettlement.com. Checks probably won’t be mailed out until late 2015 at the earliest. Found via Farnam Street. Also see my book review of The Omnivore’s Dilemma. Some other thought-provoking videos on the same RSA channel as well.